Calling all of my Boston, MA people! Tomorrow night we will be bringing a little slice of NYC to Beantown/ Cambridge at the famous Soulelujah party. This time, we are changing it up and will be dropping the deep funk/ disco vibes for the number one dance party in Boston. It’s an all forty five affair, so bring those dancing shoes and get ready to sweat until last call. These cats have been doing it STRONG since 2003, so you know it’s going to be a good time. If you are in the Boston area, we will be doing it disco this Saturday night March 25th, so come rock with us. Also on the bill is the ever reliable Claude Money and more, so if you like good, funky music, here’s your chance to sweat it out until the lights go on. See you on the dance floor. More info on the night here. Check out their Facebook here. Here is my live set from the last time I played the party. This entry was posted in Crate Digging, Live Gigs, Records and tagged 45 RPM, Boston, Crate Digging, DJ Prestige, Flea Market Funk, Live, Records, Soulelujah, Vinyl. Bookmark the permalink. 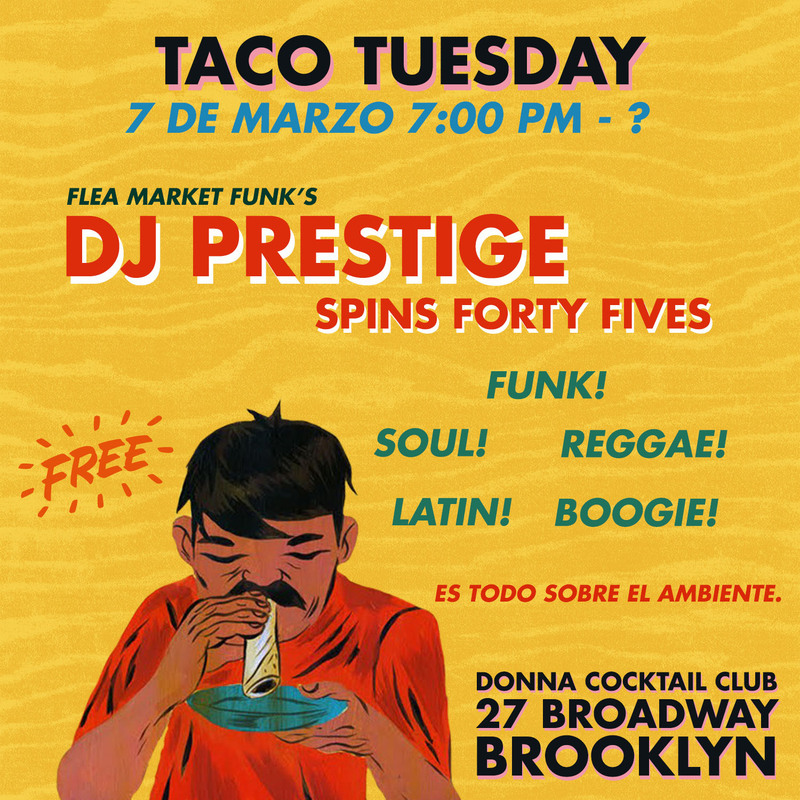 Dropping a grip of 45 rpm gems tonight over at Donna Cocktail Club for their weekly Taco Tuesday night. I’ll be bringing some funk, soul, latin, boogie and reggae joints for the people. Good cocktails, great food, and good vibes in Williamsburg, Brooklyn. NYC stand up! This entry was posted in Crate Digging, Live Gigs, Records, Vinyl and tagged 45 RPM, 7" Records, Brooklyn, Crate Digging, DJ Prestige, Donna Cocktail Club, Live Gigs, Music, NYC, Record Digging, Taco Tuesday. Bookmark the permalink. Jersey City let’s Get Funked! Back at it again at South House in the Pedestrian Plaza in Chilltown. 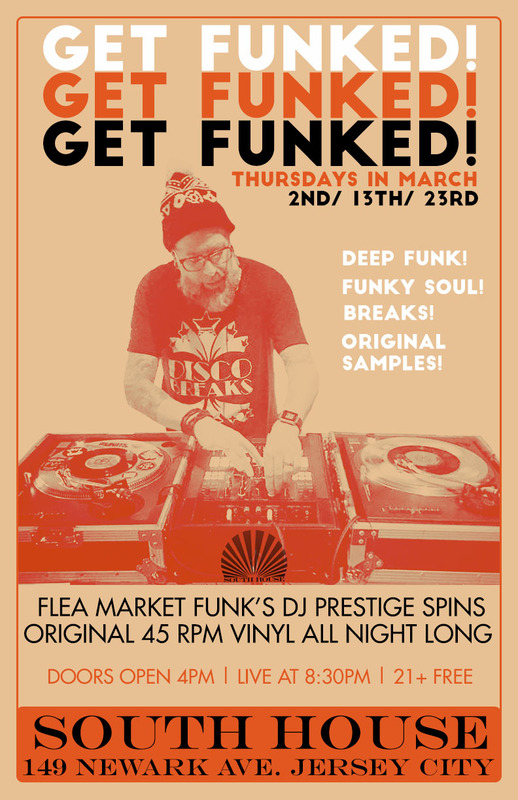 All 45 rpm sets of deep funk, funky soul, original samples, breaks, boogie and more from DJ Prestige. Full menu and drink specials all night long. 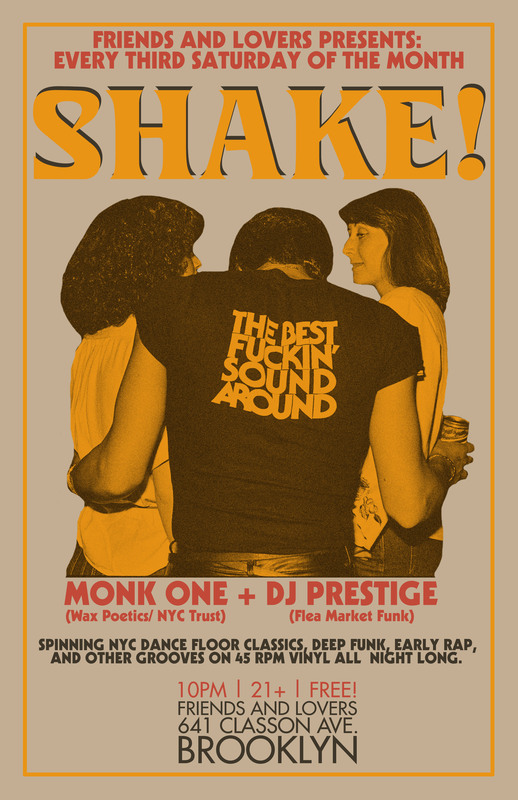 Come get funky with us on #NewarkAve. 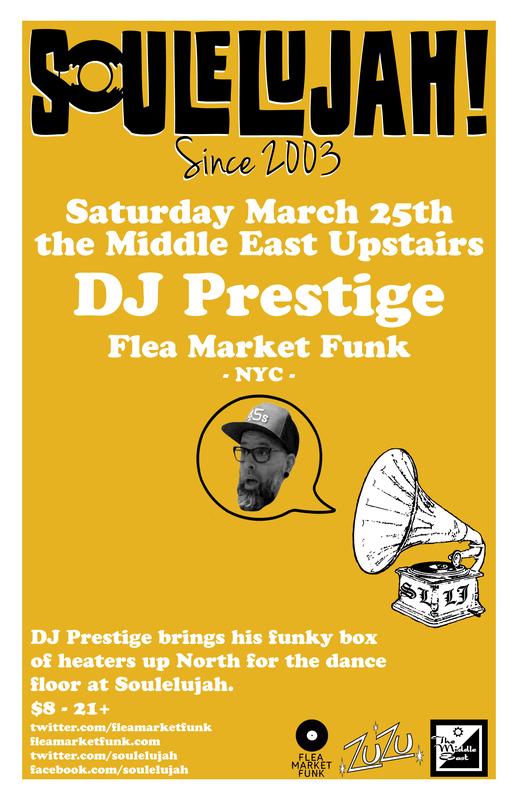 Flea Market Funk’s DJ Prestige Live! This entry was posted in Live Gigs, Records, Uncategorized, Vinyl and tagged 45 RPM, Crate Digging, Flea Market Funk, Get Funked, Jersey City, Live, Music, New Jersey, Record Digging, Records, South House, Vinyl. Bookmark the permalink. 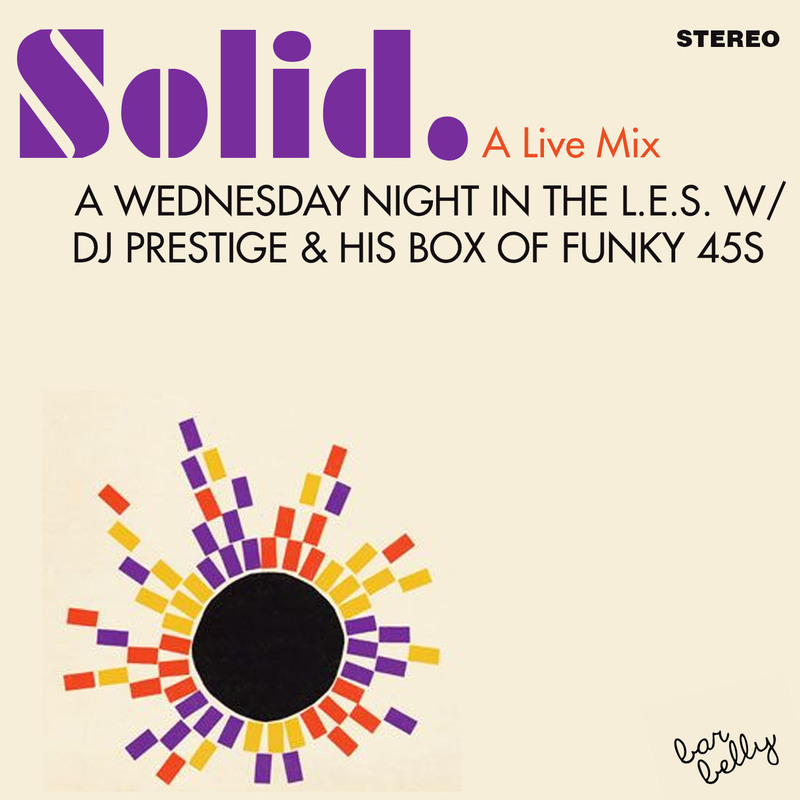 This is a mix of tunes that would typically be played on my Wednesday night residency at bar belly in the Lower East Side of Manhattan in NYC. Bar Belly is an intimate space where I go from deep funk, to soul, Brazilian beats to instrumental early rap, original samples to dub reggae, and Latin boogaloo to garage rock, spinning for a crowd of music lovers and dancers who come for the vibe. 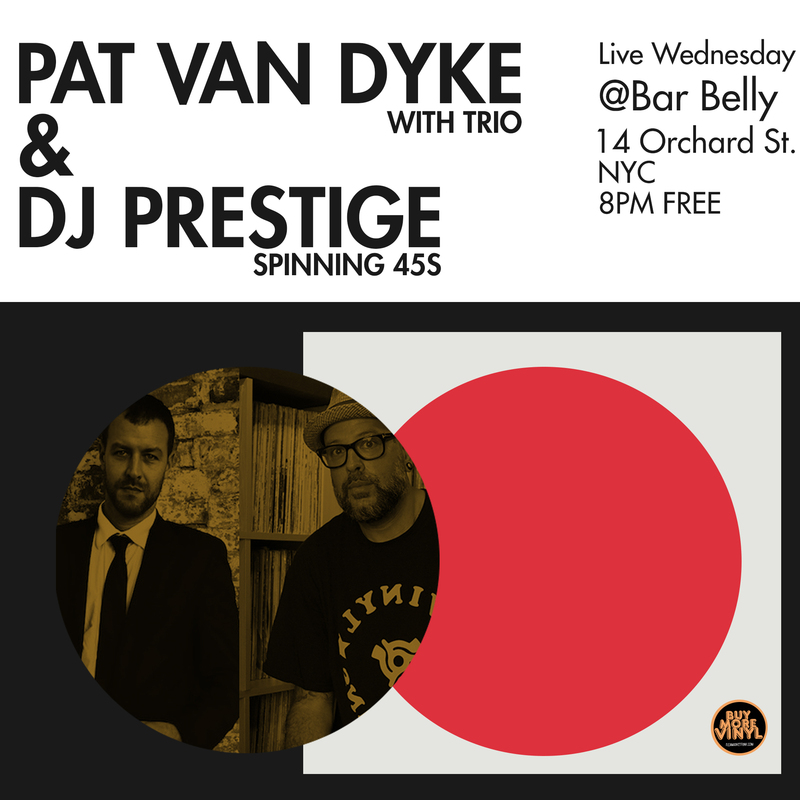 The Wed. night features Pat Van Dyke and his trio getting the crowd warmed up with their brand of funky jazz and more, and then I take over with my funky little box of 45s to end the night. The mix was done live, all in one take, because you never get a second chance. Enjoy! This entry was posted in Live Gigs, Mixes, Records and tagged 45 RPM, Bar Belly, Crate Digging, DJ Prestige, Flea Market Funk, Live Mix, Mix, New York City, NYC, Record Digging, Solid, Vinyl. Bookmark the permalink. This entry was posted in Crate Digging, Live Gigs, Records and tagged 45 RPM, Brooklyn, Crate Digging, Crown Heights, Dance, Dance Party, DJ Monk One, DJ Prestige, FREE, Friends and Lovers, NYC, Record Digging, Shake!, Vinyl Records. Bookmark the permalink. This entry was posted in Crate Digging, Live Gigs, Records and tagged 45 RPM, Bar Belly, Crate Digging, DJ Prestige, Flea Market Funk, LES, Live, Music, NYC, Pat Van Dyke, Record Digging, Records, Vinyl. Bookmark the permalink. This entry was posted in Crate Digging, Live Gigs, Records and tagged 45 RPM, Crate Digging, DJ Prestige, FREE, Get Funked, Jersey City, Live, Newark Ave., Record Digging, South House. Bookmark the permalink. 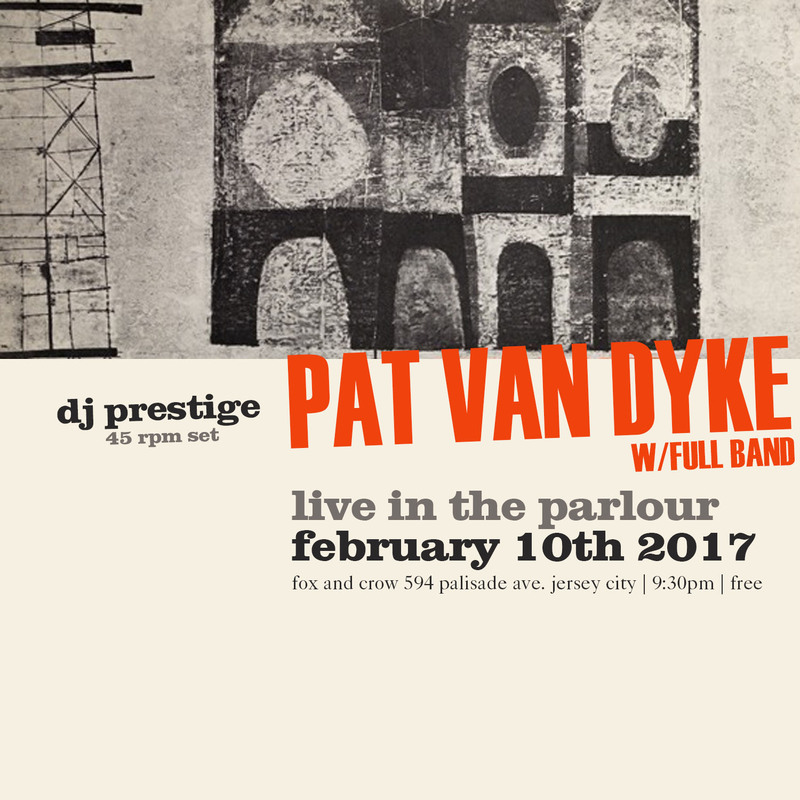 On February 10th in the Heights of Jersey City, DJ Prestige will be performing an all 45 set before, during, and after a live performance from bandleader Pat Van Dyke with a full band in The Parlour of Fox and Crow. This intimate space has been a hot spot for a minute, and the pairing of the band and DJ has consistently sold out quick, so get there early! PVD always assembles a top notch bunch of musicians to accompany him for this gig, so it’s not to be missed. 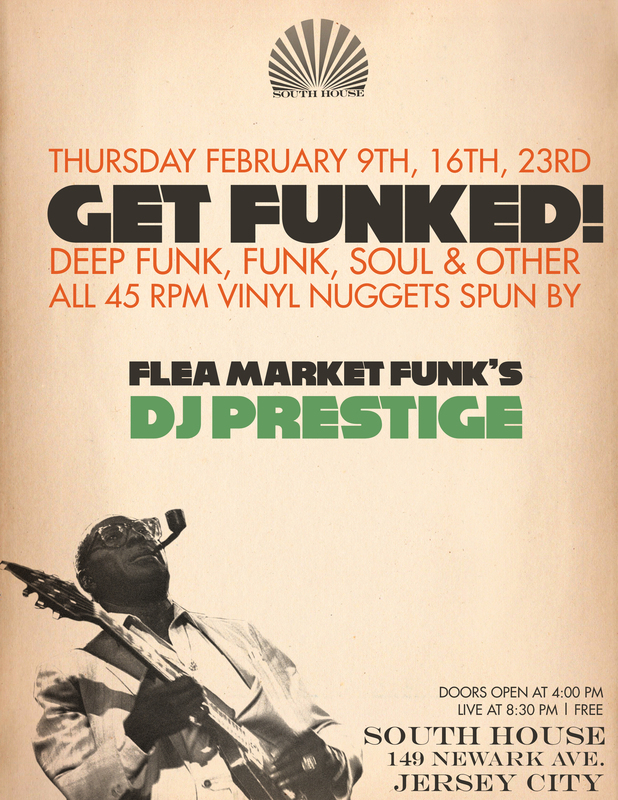 Prestige will be dropping a variety of funky 45s for your ears, so swing through! Check out the event page here. This entry was posted in Crate Digging, Live Gigs, Records and tagged 45 RPM, Crate Digging, DJ Prestige, Fox and Crow, Jersey City, Live, Music, Pat Van Dyke, PVD, Record Digging, Records, The Heights, Vinyl. Bookmark the permalink. 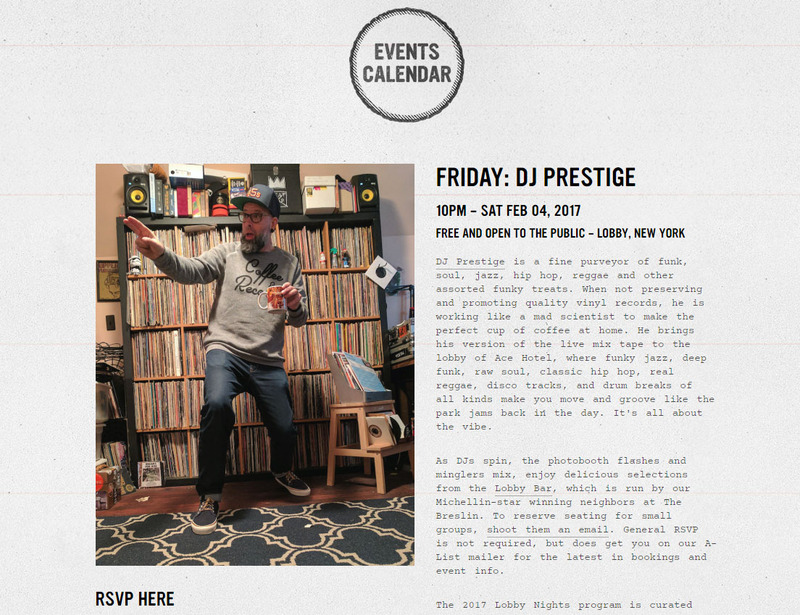 This entry was posted in Crate Digging, Live Gigs, Records and tagged #lobbynights, Ace Hotel, DJ Prestige, Flea Market Funk, Live, Live Mix Tape, New York City, NYC. Bookmark the permalink. 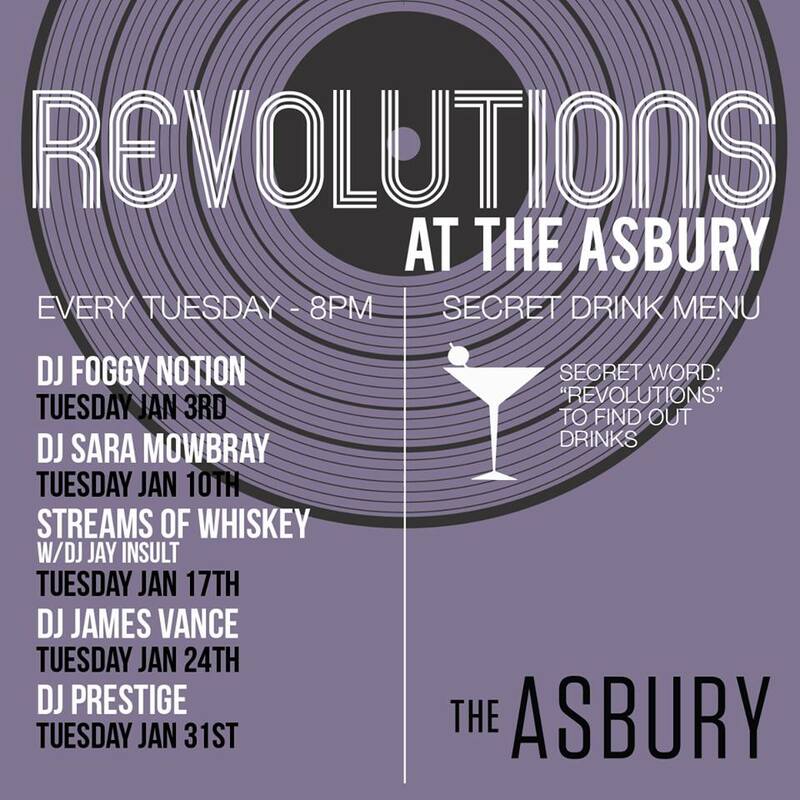 It’s been about six years since I have DJed in Asbury Park proper, so I’m excited to be asked to drop a guest set over at The Asbury’s Tuesday night all vinyl Revolutions party. I’ll be bringing an eclectic bag of funk, soul, reggae, African, Brazilian, latin and other assorted funky 45s to the tables that evening. Hope to see some familiar faces out. Cheers. This entry was posted in Crate Digging, Live Gigs, Records and tagged 45 RPM, Asbury Park, Crate Digging, DJ Prestige, Flea Market Funk, Live Set, New Jersey, Record Digging, The Asbury, The Asbury Hotel, Vinyl. Bookmark the permalink.